Sakura Ebi (Shrimp) is not something common in Penang, but Dcova surprised their costumers by importing a limited stock of Sakura Ebi all the way from Japan, so that they can serve the Sakura Ebi Pasta during their the 2nd anniversary celebration, which is began today and will continue as long as the shrimps stock lasts. According to Wikipedia, the translucent pink shrimp derives its name from Sakura, the Japanese word for the cherry blossom. The species grows to about 4–5 cm and lives primarily in Suruga Bay in Shizuoka Prefecture, Japan, where it is caught to be eaten. It is also caught in Taiwan. Don’t mistaken the Sakura Ebi to be like our local dried shrimp, because the Sakura Ebi is crunchy with rich taste of the sea, which is light but flavourful. Dcova deep fry the shrimp to perfection then served with bacon based pasta. It is recommended to squeeze some lemon juice to further enhance the flavour. Dcova has a very good reputation with their Teriyaki Chicken salad, and now they are offering the Pasta version with a touch of bacon and Japanese Leeks, then served with mushrooms. Salad served with imported Goma and dried cranberry. The salad has a very strong aroma of sesame, while the cranberry added sweetness to the dish. The portion we got is meant for 2 persons, so when you order the salad, they only serve half of the salad from what you see in the photo. As stated in the menu, Yoghurt and Granola for a healthy start or even simply as a dessert for the day. Since Dcova is now collaborate with Passionis, they are now able to serve sorbet and Petit Four upon special request. 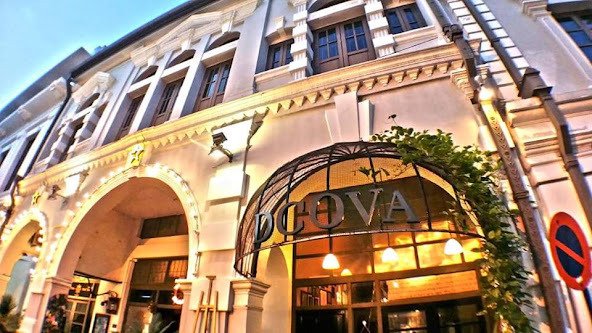 Dcova is 2 now and they giving away vouchers for diner who spend RM100 in a single receipt and get a chance to draw for the different categories available, It's a sure win! Which mean you either get free food or dessert. For those who spend RM160 in a single receipt, you get a limited edition DCOVA thumb drives. Promotion on till 17 June 2016! More about Dcova in the previous posts can be found at Premium Cake and drink and Pasta Al Nero di Seppia. Address: Logan Heritage, No.4 Lebuh Bishop, 10200 Penang. The price list presented here is as on 2nd June 2016, the day when I visited the restaurant, They do charge 6% GST but no service charge.